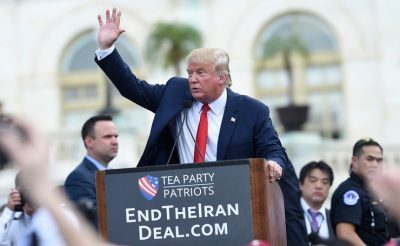 There can be no doubt that there is a new, immediate threat of destabilization, if not war, against Iran. As reported in major media and detailed in several articles on this website, the Trump administration, in tandem with Benjamin Netanyahu’s government, has been signaling its bellicose intentions loudly. The cancellation of US participation in the Iranian nuclear deal and the US recognition of Jerusalem as Israel’s capital were the stepping-stones towards subsequent threats of “CONSEQUENCES…” twittered by the rowdy US President. Whether Trump intends to start a war or to attempt regime-change (see Trita Parsi), the intention is to shift the kaleidoscope of geopolitical relations once again, with the aim of establishing Israel as the regional hegemon. In 1996, the Cheney teams issued “A Clean Break: A New Strategy for Securing the Realm,” prepared by The Institute for Advanced Strategic and Political Studies’ “Study Group on a New Israeli Strategy Toward 2000.” The title referred to the opportunity and need, in the event of a new Israeli government under Benjamin Netanyahu, to make a total break with the Oslo Accords of 1993, which had promised progress towards peace between Israel and the Palestinians. Instead, Israel should work closely with its neighbors Turkey and Jordan to contain, destabilize, and roll back some of its most dangerous threats. Instead of pursuing a comprehensive peace, Israel should resort to a traditional concept of strategy based on balance of power. To deal with its perceived regional threats, Israel should “engage” Syria, Iran, and Hezbollah (considered as “agents” in Lebanon), and not exclude military forays into Lebanon. Israel should “contain” Syria and reject any land for peace deals on the Golan Heights. Israel should “focus on removing Saddam Hussein from power in Iraq,” and should curry favor with the Hashemite regime in Jordan to ensure its support. The paper endorsed a “Change in the nature of its relations with the Palestinians, including upholding the right of hot pursuit for self defense into all Palestinian areas and nurturing alternatives to Arafat’s exclusive grip on Palestinian society.” The thrust of the document was that the entire Middle East should be reshaped through regime change in Iraq, Iran, Syria, and Lebanon (either by war or other means), and the parallel consolidation of nuclear-armed Israel as the regional hegemonic power. The “Clean Break” paper was delivered to Benjamin Netanyahu who, days later, presented the overall political thrust to a joint session of the U.S. Congress as his government policy. In 2006 Israel waged war against Lebanon, targeting Hezbollah, and attacked Hamas in Gaza. At the end of 2008 came another Gaza war, which implemented the new approach to the Palestinians detailed in the “Clean Break” paper: “First and foremost, Israel’s efforts to secure its streets may require hot pursuit into Palestinian controlled areas, a justifiable practice with which Americans can sympathize. …” The Bush regime did indeed sympathize. By 2008, the aims of the doctrine had been pursued in Lebanon and Iraq. The Israelis, who had been clamoring for years for a green light from the Bush-Cheney regime for a “preemptive” strike against Iran’s nuclear installations, had been prevented in late 2007 by the National Intelligence Estimate report which said that Iran did not possess a nuclear weapons program. It did not happen then, but Israeli military planners did not give up on a future strike against Iran. And in preparation, they had to neutralize those factors which could be activated in sympathy with the Islamic Republic. Hamas was attacked again in Gaza in 2014. Looking at the region today from the standpoint of the strategic aims of “Clean Break,” Israeli planners must be checking off items on the list: Syria has not only been contained, but through prolonged war the country has been largely destroyed; Saddam Hussein is gone from Iraq; Hezbollah and Lebanon represent no existential threat to Israel; as for the Palestinians, there has been a “change in the nature of relations” indeed, with Hamas being militarily attacked and economically choked in Gaza, while the Palestinian Authority faces a fait accompli in Jerusalem and the new law on the Jewish state. And though the Bush crowd is gone, Bolton and company are back and Trump has endorsed the entire agenda. From this viewpoint, Iran is being isolated and there should be no doubt, considering the recent moves in Washington and Tel Aviv, that the Islamic Republic is next on the hit list. The author can be reached at [email protected]. 1. Through the Wall of Fire: Armenia-Iraq-Palestine; From Wrath to Reconciliation, Ithaca Press, Reading, 2012. 2. ”A Clean Break: A New Strategy for Securing the Realm,“ www.iaps.org/strat1.htm. This document was the application to the Middle East of the so-called “Wolfowitz Doctrine,” or plan to establish the U.S. as the sole dominant world power. It was authored by Cheney aide David Wurmser, his wife Meyrav, Richard Perle, James Colbert, Charles Fairbanks Jr., Douglas Feith, Robert Loewenberg, Jonathan Torop, among others.